This article first appeared in the Rushville Republican on August 8, 2017. In March of this year the Rush Memorial Hospital Foundation launched a new grateful patient program called Seeds of Care. The purpose of this program is to celebrate and honor outstanding RMH employees that have provided caring and exceptional service to Rush Memorial Hospital’s patients and guests. With a donation to the RMH Foundation the donor can explain the exceptional service that they have received and share the story of why they have chosen that particular employee or department. Once the donation and explanation are received by the RMH Foundation, the honoree(s) are notified and they get to place their fingerprint on a Seeds of Care tree in the employee entrance. Each honoree is awarded a special Seeds of Care Honoree pin to wear. The RMH Foundation is pleased to announce that the RMH Surgery Department, under the direction of Kathy Newkirk, Surgery Department Director, and Teresa Geis, Anesthesiologist, has been honored as the first Seeds of Care recipients. Shortly after Tonia Biehl, Sanket Naik, Lindsay Nobbe, and Sally Kelso from the RMH Rehabilitation Department have been honored as Seeds of Care honorees too. “The professionalism and care that I received was outstanding. Thank you for making me feel comfortable as I prepared for surgery”, stated the Surgery Department donor. 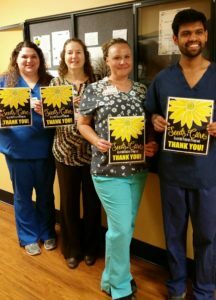 “Tonia, Lindsay, Sanket, and Sally always make me smile and my rehab time enjoyable. They have been wonderful to me”, shared the donor about the Rehab employees. How can you honor an RMH employee or department? Seeds of Care flyers can be found in every department, volunteer desk, and building on the Rush Memorial Hospital campus. The flyers explain the program and have a donor section where you can share why you are honoring the person(s). The donation and the form can be mailed to the RMH Foundation Office or dropped off at the RMHF office.